Welcome To 105 Arjay Crescent. 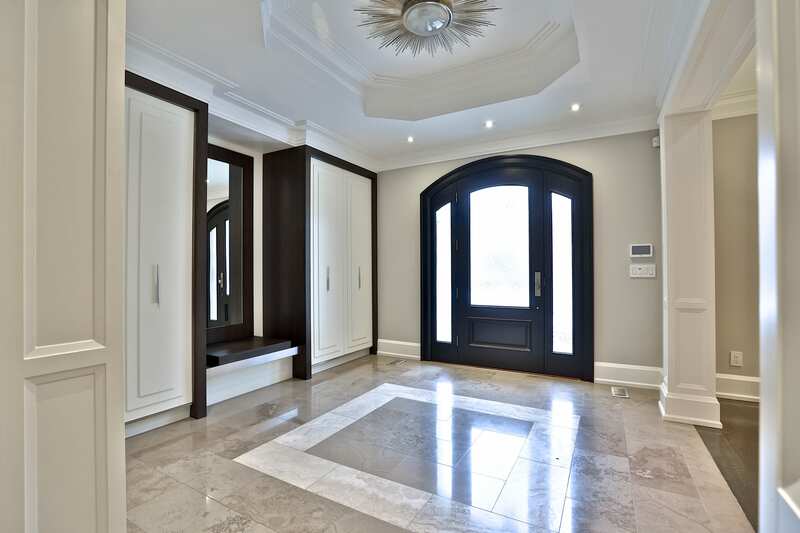 This Palatial Custom With Spectacular Finishes & Designer Palette is Nestled On Secluded Most Sought After Bridle Path Area Cresent. Contemporary Elegance & Over 8,000 Square Feet Of Living Space. Impeccable Mill Work. Elevator. Soaring Ceilings. Back-Lit Leaded Glass Domed Cathedral Foyer. Sprawling Dream Kitchen With Top Of The Line Appliances, Servery & Breakfast Area. Lavish Master Bedroom Boudoir With 9 Piece Ensuite and Sitting Room. Expansive Walk Up Lower Level Features: Wine Cellar, Spa, Recreational Room, Home Theatre, Nanny Room, Wet Bar & Gym. Resort Like Backyard. Unobstructed South Views! The Grand Foyer Features An Imposing Solid Wood Door With A Frosted Glass Inlay And Glass Sidelights, Alarm Pad, Marble Floor, Soaring Cathedral Ceiling, Pot Lights, Crown Molding, Coffered Ceiling, A Light Fixture, Recessed Paneled Archways Opening On The Main Hall And Living Room, Two Custom Built-In Cloak Closets, A Framed Mirror And A Built-In Bench. The Gourmet State Of The Art Kitchen, Entered Through An Archway Off Of The Main Hall And Open In Design To The Breakfast Area And Family Room, Features Marble Floor, Pendant Lighting, Pot Lights, Crown Molding, Custom Waffle Ceiling, Custom Designed And Crafted Floor-To-Ceiling Cabinetry, Self Closing Drawers, Recycling And Garbage Pull Out Drawer, Spice Racks, Pantry Pull Out Cabinets, Tile Backsplash, Quartz Countertops, Under Valence Lighting, Appliance Garage, Several Glass Front Display Cabinets, A Window Outfitted With Custom Blinds Overlooking The Rear Gardens, A Stainless Steel Under Mount Sink With A Soap Dispenser, An Additional Stainless Steel Dual Bowl Under Mount Sink With An Industrial Faucet And Soap Dispenser. The Kitchen Also Features A Sprawling Center Island Complete With Ample Storage. The Breakfast Area, Surrounded By Windows Overlooking The Lush Greenery And Swimming Pool, Features Pot Lights, Marble Floor, Chandelier, Crown Molding, Waffle Ceiling, A Picture Window Outfitted With Custom Blinds And Drapery Overlooking The Rear Gardens And A Double Walk Out To The Terrace And Gardens. The Master Bedroom Suite, Entered Off Of The Anteroom, Features Quarter Sawn White Oak Hardwood Floor, A Light Fixture, Crown Molding, Pot Lights, Box Ceiling Design, A Wall Of Windows Outfitted With Custom Drapery And Blinds Overlooking The Rear Gardens, A Zen-Like Gas Fireplace With A Marble Surround And Floor-To-Ceiling Wood Mantle And A Custom Built-In Wall Unit Comprised Of Glass Shelves And Ample Additional Storage. The Lavish 9-Piece Ensuite Bath Features Marble Floor, Built-In Speakers, Chandelier, Pot Lights, Crown Molding, A Custom Wall-To-Wall Vanity With “His” And “Hers” Under Mount Sink, Wall Mounted Faucets, Quartz Countertop, Framed Mirrors, Ample Storage, Light Sconces, A Custom Makeup Area, A Picture Window Outfitted With Custom Drapery Overlooking The Rear Gardens, A Free Standing Spa-Like Deep Soaker Air Jet Tub And A Water Closet Housing The Toilet And Bidet. The Ensuite Also Features An Expansive Seamless Glass Shower With A Custom Built-In Bench, Soap Box, Marble Floor, Tile Surround, A Steam Unit, Body Jets, Handheld Faucet And A Rain Forest Shower Head. The Sprawling Boudoir Features Quarter Sawn White Oak Hardwood Floor, A Light Fixture, Skylight, Pot Lights, Mirror, Custom Floor-To-Ceiling Built-In Cabinets, Illuminated Double Stacked Hanging Racks, Custom Pull Out Drawers, A Custom Built-In Bench, A Frosted Window, Open Display Shelving, Pull Out Laundry Hamper, Long Hanging Capabilities, Glass Shelving And A Center Island With A Quartz Countertop. The Sprawling Recreation Room, Open In Design To The Wet Bar, Features Heated Tile Floor, Pot Lights, Crown Molding, Built-In Speakers, Above Grade Windows Complete With Custom Blinds, A Custom Wall-To-Wall Built-In Comprised Of Open Shelving, A Zen Like Gas Fireplace With A Marble Surround And Stainless Steel Mantle. The Wet Bar, Open In Design To The Recreation Room, Features An Alarm Pad, A Pair Of Doors Leading To The Deck And Gardens, Pendant Lighting, Crown Molding, Pot Lights, Built-In Speakers, Custom Floor-To-Ceiling Built-Ins Comprised Of Open Display Shelving, Tile Backsplash, A Quartz Countertop, Frosted Glass Front Display Cabinets, A Stainless Steel Under Mount Sink With A Soap Dispenser And A Center Island With An Expansive Stainless Steel Bar. Most Spectacular Finishes Offering a Contemporary Elegant Design over 5490 Square Feet of Living Space.